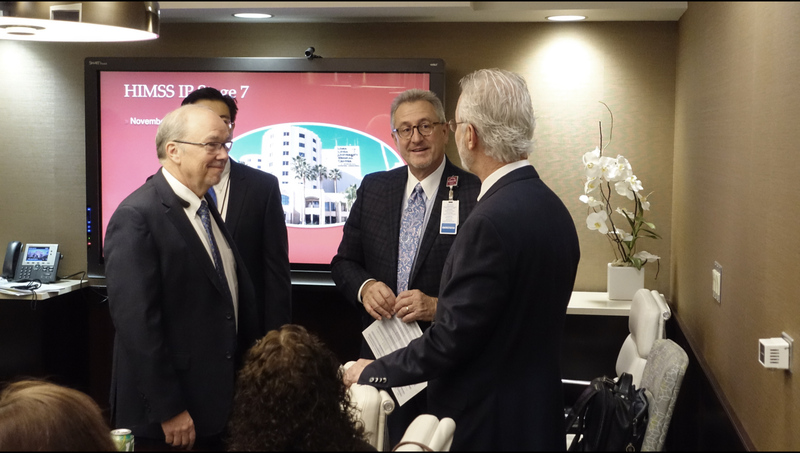 From left, CIO Mark Zirkelbach, MPA, and CEO Kerry Heinrich, JD, speak with surveyor Philip Bradley when the HIMSS team visited Nov. 7 and granted Stage 7 status for inpatient electronic medical record adoption. Held by only 6.1 percent of hospitals, Loma Linda University (LLU) Medical Center, Children’s Hospital, Surgical Hospital and East Campus have achieved Stage 7 of the inpatient Electronic Medical Record Adoption Model (EMRAM) from the Healthcare Information and Management Systems Society (HIMSS) Analytics. One of the many initiatives launched by the organization included a decision support tool. This was created to help providers and pharmacists improve the ability to conduct complicated calculations to reach effective use of vancomycin, an antibiotic to treat infections. LLU Medical Center began by programming calculations into patients’ electronic medical records to help ensure faster delivery of information and more consistent results in reaching goal blood levels. “Loma Linda University Medical Center’s commitment to excellence is best seen in their use of technology to calculate vancomycin dosing, especially in pediatric patients,” said Bradley. After thorough staff training and positive results shown from trial runs, the organization has begun implementing the new process across all of their Children’s Hospital units. HIMSS Analytics will recognize Loma Linda University Medical Center at the 2018 HIMSS Conference & Exhibition, held March 5-9 at the Venetian-Palazzo-Sands Expo Center in Las Vegas. Visit the HIMSS Analytics website for more information on the health care provider maturity models and Stage 7 award. HIMSS Analytics is a global healthcare technology market intelligence, research and standards organization assisting clientele in both healthcare delivery and healthcare technology solutions business development to make lasting improvements in efficiency and performance. Visit the HIMSS Analytics website for more information on the EMRAM and other maturity models.